I’ve heard good things about ARTistic Pursuits Inc. over the years, but I’ve never taken the opportunity to review for them – until now. In the past, the supply lists have been a big turnoff for me, but as my children are getting older and their interests are developing, we actually have some of the supplies on hand for a curriculum like this now. When the list of options for this year’s Schoolhouse Review Crew run came out, I was pleased to see that one of the options was Middle School Book One. 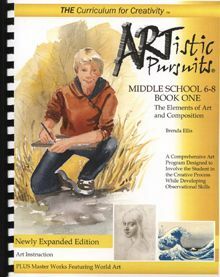 Since I have a middle schooler who is an art enthusiast, I looked into this curriculum. I was ecstatic to learn that the supply list for this book included all things that Seahawk had received for Christmas – primarily, high quality drawing pencils in a variety of lead hardness, erasers, waterproof ink, a nib pen (holder and nibs), and paper. So, for the first time in three years, I requested to be on this review. 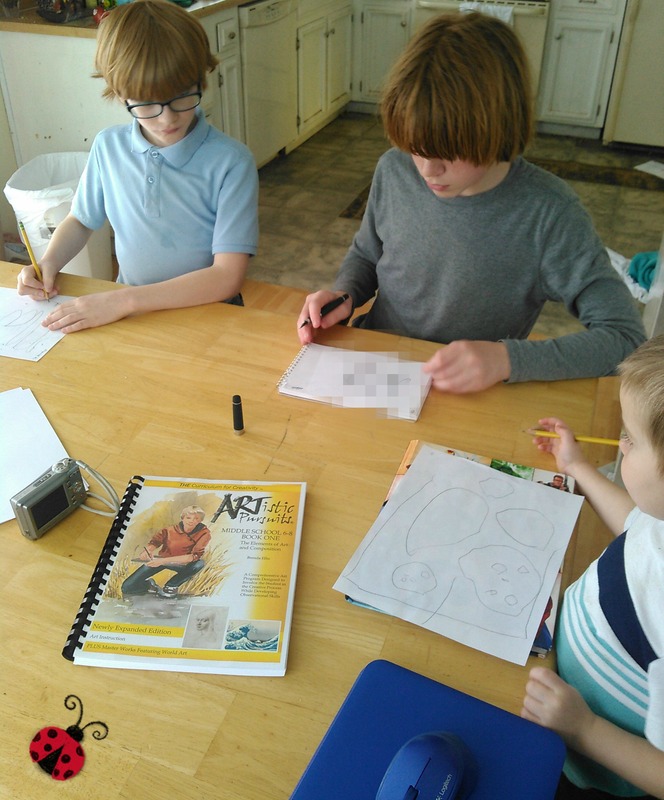 ARTistic Pursuits is a company passionate about creating artists, especially in the homeschool setting. They have a variety of textbooks ranging from preschool to graduation, which are specially designed to help children learn to harness the powers of observation while they explore art history, art appreciation, and art technique. When we first received the book, I had big ideas of everyone working on it together. We even did the first lesson all together (even Small Fry, who’s just 3) the same day the book arrived. 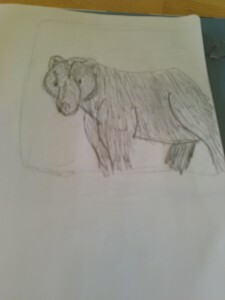 It became clear in the lessons that followed, however, that just because your kids like to draw, it doesn’t mean that they’re ready for formal lessons. This was the case with everyone but Seahawk. And that’s okay. He’s the only one technically in the age range for this curriculum, anyway. So after that first week, I let him do this subject on his own. Each lesson consists of a short passage to read followed by an art assignment. Since the review period lined up with the beginning of a beautiful spring here in the Pacific Northwest, he would often take his book, drawing pad, and pencil set outside to work. There was not one time when he brought me his work to look over that didn’t leave me impressed. I found this to be the “funnest” class, that’s for sure. Before I used this book, I thought I knew everything there was to know about drawing. I just couldn’t master it. 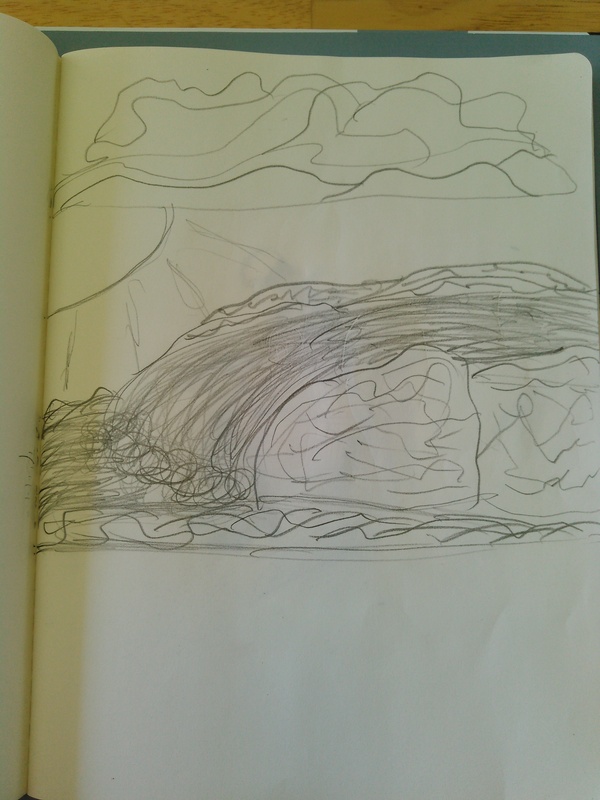 The book taught me different ways of using pencil lines to emphasize things and different ways to use combinations of shapes to make things look right. The book was challenging, but in a good way. 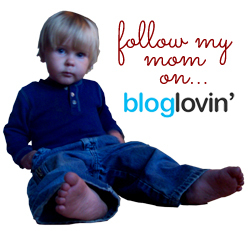 My thoughts as a mom? This is a high quality book full of great tips for learning to become master of your supplies. I like how there are stories and lessons from a variety of world areas, which are used to teach different drawing techniques. I like how it teaches independence as well as art. 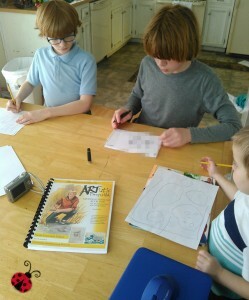 Once the student knows the basics of how the lessons are set up, it’s easy for them to work on their own (especially good for non-artistic parents, or those whose art skill set lies elsewhere, like me). And I really like how they state right on the book that’s it’s designed to be non-consumable. This means that a single purchase (this book is $47.95) will cover all of your children, even if they’re all different ages. You can use it over and over again. Talk about value! What’s not to like about ARTistic Pursuits? I can’t think of a single thing! I’ve read dozens of positive reviews for this company over the years, and now I know why. The materials are top notch. As with all Schoolhouse Crew Reviews, there are loads of other reviewers talking about ARTistic Pursuits this week. 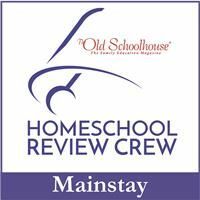 You can visit the Crew blog to find what they all thought about the variety of books ARTistic Pursuits offered for review this time (which include books for all grade levels, preschool through high school, and a pair of sculpture books).